Casey and I met Marta in Paris for a one day adventure….it turned out somewhat of a “death march”. We met early morning at a cafe at the hotel de ville, had a coffee, and admired our beautiful little gifts, handmade by Marta. Marta is as graceful and loving, vibrant and radiant as she comes across on her blog and she is never without her wide, beautiful smile! See some photos. We then took to the streets. Dropped in at Shakespeare and Company. I cheated here…sketched them from a photo later at home…it is far too small inside and I had far too few hands and far too many books to browse. The rain stopped as suddenly as it showed up and the sun took us further on our march, into Le cimetière du Montparnasse. By now, the sun had made way for the approaching evening and it was time for a body warming chocolat chaud. For me, this is the finest hour to be in Paris on a cold, wet winter’s day; the bars are filled with atmosphere, warmth and people meeting up to warm their hands around a hot chocolat chaud, the coats and scarves wrapped around chairs, the garcons serving up drinks in a chatty mood, the lights outside are playing on the wet streets, people are heading home from work with baguettes under the arms, pinching off a piece of crust every now and then. The end of a long awaited day. Crossing Paris on foot, experiencing both bright sunlight and pouring rain, enjoying wine and food and song, sharing stories, painting and writing some memories, saying warm hearted goodbyes with promises for futures that may just happen…Life is a gift. Sketches done in moleskine with pen and WC. An urn overflowing with autumn chrysanthemum in Jardin du Luxembourg. Ronell, these look wonderful! I’m going to do a couple of drawings from photos later too – that day just went by far too quickly to get much drawing done! ooooh! very beautiful.. love your sketches and your description of the day. I can smell the chocolate! It does sound and look like a wonderful day! As always, your sketches are so colorful and interesting! I love visiting here. What a wonderful day! And wonderful sketches too. Sounds as though you had a wonderful day. I’d love to visit Paris. (one of my dreams). Great pics and inspiring sketches. You painted such an enjoyable account of your day, Ronell I got totally swept up in it all. Madly envious, particularly of the visit to the book shop and the art shop. 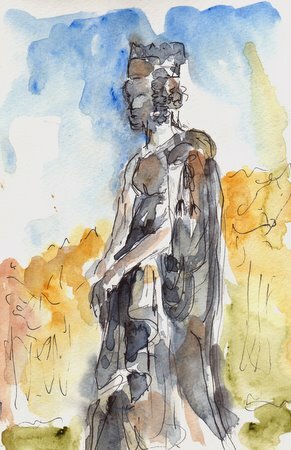 Gorgeous watercolour sketches of the statues and you have a very sure and elegant touch with the urn. Delicious post! Ooh, you three had such a great time. And looking at your sketches let me imagine being there, too. Lovely. Oh, Ronell! I am green with envy! What a fun time! And such glorious images … I can’t get enough of your painterly, brilliant style! Ronell!! I am green with envy! What a fun, fun time …!! And your paintings!!! So gloriously fresh, painterly, inspirational, sublime!! I can’t get enough of your fantastic painting style! These Paris sketches are just wonderful. I love the loose and free quality of them plus these are also my favorite Paris haunts. I wish that when I was in the Loire Valley with my 14 year old grandson this July, that I had the nerve to get in touch with you. Maybe next time when I’m in Paris, I will. A trip to Paris, courtesy of Ronell, Marta and Casey! I’ve thoroughly enjoyed all the posts, paintings and photographs. (It’s lovely being transported from rural Oregon… to enjoy (vicariously) a busy day in Paris.) Your post was particularly eloquent, Ronell. A visit to Shakespeare & Co. alone would be a wonderful experience, but you also got to paint in a garden, meet a new friend, enjoy delicious food – how fun! Thanks so much for sharing your experience with us. A treat, as always! Okay, do you know how sad I am that we did not meet up? I am glad you and Casey did meet up with Marta. I am just pretending I was there with you all as you talk about the places I was just at only a few weeks before. Your sketches are great and stir up my own memories. Thanks for sharing. I would recognize Casey’s back anywhere! ;D. Seriously, you did an amazing job with both of their postures–it is this kind of attention to detail and this level of skill that makes a drawing or painting. And both are so characteristic of your work. 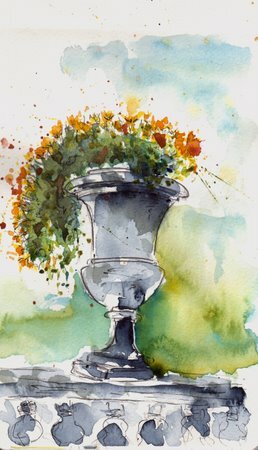 Funnily enough, at the end of last October,I did a sketch of one of those urns from Luxembourg gardens, filled with chrysanthemums, that looks the twin of yours! Great day, great sketches and I envy your stay at Sennelier. I’ve bought 2 boxes of pastel as I like them very much. Wonderful account of your day, love the bookshop sketch I actually recognised Marta in the sketch before I read! Your self portrait drawing is tremendous – such sure and confident marks, and a great expression! I love it. Ahhhh – I wish I could have been your fourth – maybe next time – Glorious posts as ALWAYS and I wish they would keep coming so I can continue to pretend I am still there ! Oh I am also so envious of all of you spending such a glorious day together. I am glad that Marta had the opportunity to meet you in person and I cant wait to see the photos! Beautiful sketches, all. It’s so fun to read about the day from all of you. I really like how you’ve handled the bookcases in that first one. Not too much detail, not too little. That is a subject that has always perplexed me! Sounds like you had a wonderful day. Ahhh…Paris, must be my favourite city!! Gosh, doesn’t sound like a death march to me! I love the bookstore sketch. Having never been to Paris (or Europe for that matter), it’s interesting seeing it through your vision compared to Laurelines. What I see here looks so warm and friendly. What a great day! Just fantastic. I don’t care if you cheated, the bookshop painting is just brilliant. Wow, it certainly sounds like you spent a great day. I love all the sketches, b«ut the bookshop one, with or without the photograph, is the one that says the most to me. 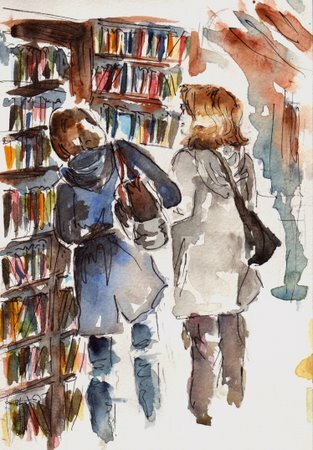 I love books and bookshops and this sketch has just that feeling of a cold rainy day outside, and you two inside a cozy shop, with ceiling high bookshelves, well, in heaven, really. thanks for the mini vacation of enjoying your recent sketches. 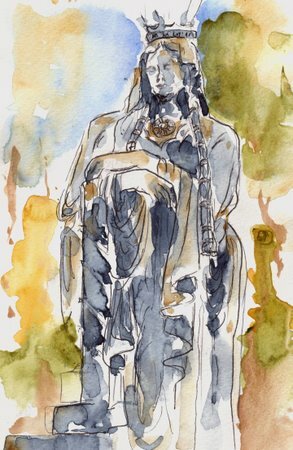 I love the urn and your studio sketches. I would love to have a fireplace in my studio. By the way, sketching from a photo that you took, is never cheating, it’s just using another tool. You still captured the feeling of the bookstore. Previous Previous post: A revealing selfportrait. Next Next post: Sketching with a coffee and a good friend.